The Giemme System is an important architectural bio-compatible element which can help to improve energy efficiency of a building through the “solar greenhouse” principle. It’s an energy storage system created by using a high volume of glazed surfaces that allow the suns’ rays to penetrate inside creating an increase of heat and natural lighting. It’s a simple and effective way to save energy in a building and can be achieved by closing off balconies, terraces, porches and other cavities. What are the regulations for a solar greenhouse? How can the greenhouses be created? On many buildings there are tanks carved into the roof on the terrace or arcades which are exposed to solar light. This is an inefficient use of energy. All south facing terraces are perfect for capturing this solar energy and according to the new regional regulations they can be closed off and used as bioclimatic greenhouses. The same principal cannot be applied to terraces facing the north, east or west. In fact in these cases the greenhouses wouldn’t be hit by solar rays so wouldn’t be able to accumulate thermic energy suitable to the regulations. In general if terraces are closed off for energy purposes, the legislation doesn’t consider it in the technical volume when counting the overall energy volume of the building. In other words, the volume is “given” and doesn’t require any planning permission, just a notification of the commencement of the works. A technical report certifying energy savings may be required. What is a technical volume? A technical volume has a plant or energy function with non-residential use. Technical volumes may include boiler rooms, spaces for storage tanks for solar thermal systems, shafts for plumbing and even the bio-climactic solar greenhouse. When can the regulations not be applied? The legislation is active in almost all Italian regions. However,check with a trusted designer if the rule is valid in your area or if there are historical or architectural constraints that prevent the application. In fact there are some constraints at a council or even condominium level. What are the correct steps to follow to check feasibility? Our advice is to check with a professional, a surveyor or architect who works at your local council. Such restrictions apply in certain areas, for example, some councils require the construction of a glass roof for others it is sufficient to close off only the perimeter with glass. Once in possession of this preliminary information you can proceed with the preparation, if required, with the documentation submitted into the council. If I were to have a bioclimatic greenhouse what other benefits would there be apart from energy saving? As mentioned above, the technical volume is “given” and cannot be computed in the total volume of the building. The commercial value of the property will increase due to the partial compliance of the legislation concerning the energy certification of buildings. Additionally, the concerned area seems much brighter during the winter season due to the refraction of the glass surfaces. Can the Giemme System windows be considered detachable/removable? 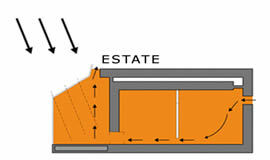 The Giemme System is considered a locking system for external partitions and not as a real frame. It can also be opened up completely and doesn’t impair visually. Thanks to these features it can be recognised as detachable/removable depending on local regulations. In this case it can be installed without creating an increase in volume. 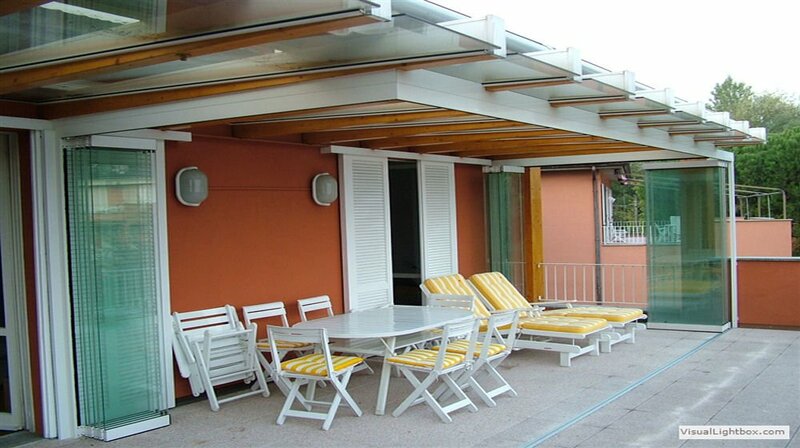 In any case, given the complexity and differences between the local Italian regulations, it is always best to check with your local council for any restrictions, if possible with the help of a trusted professional or designer. How does the solar greenhouse work? 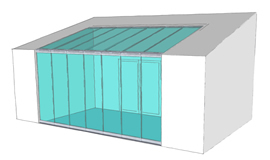 The solar greenhouse, created by the all-glass Giemme System doors can be harnessed to produce energy in both winter and summer. During the winter, the sun’s energy penetrates the greenhouse. Thermal energy is accumulated by the floors, walls and air and then transferred indoors by an installed tubing system. 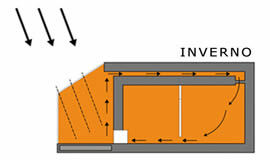 It also reduces the dispersion of the internal heat thanks to the solar greenhouse. 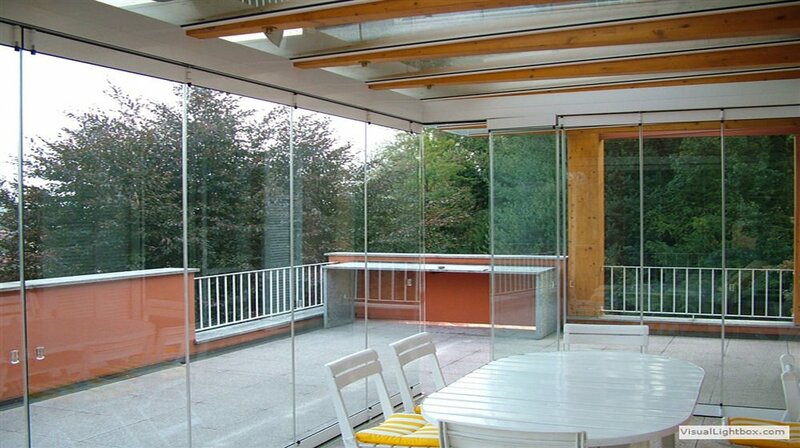 The folding glass door Giemme System, made with 10mm tempered glass, is a real barrier against air and other atmospheric elements. This is thanks to the transparent polycarbonate seals between the doors and the system of perimeter seals in EPDM polypropylene fibres. The Giemme System complies with UNI EN 14351-1. When the greenhouse is closed during the summer, the heated air circulates in the so-called “solar chimney”. This creates a continuous flow of air and thus naturally cools the building. However, please note that in summer, the Giemme System can be opened completely or partially, depending on your needs. GM Morando conducted a series of energy simulations regarding the winter scenario. It emerged that with every solar greenhouse built from the Giemme System, energy savings ranged from 4-14% and can reach up to 20% if an adequate ventilation system is in place. The solar greenhouse (and in a broad sense anything that involves energy saving) is strongly protected by both national and regional community law. With this in mind, many building regulations and councils are moving in a positive direction by adopting streamlined procedures to promote and encourage building made for the purpose of energy saving. For example, this could be tax benefits, recovery of usable volume areas, compatible with the regulations in force in the local council where you want to install it.